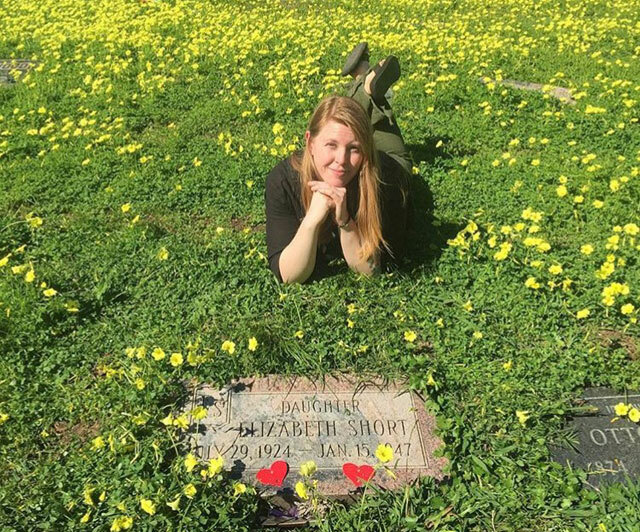 In her spare time, mortician Laura Hardin wanders around cemeteries telling the fascinating stories of the interred for her popular Instagram account. Visiting the gravedigger in the pioneer cemetery of Goldfield, Nevada. Laura Hardin didn’t intend to have a career working with the dead. Sure, she enjoyed wandering around cemeteries, but preparing bodies for funerals wasn’t part of the plan. Lately, however, the taphophile turned mortician is making a name for herself educating the general public on the process of embalming and the idiosyncrasies of the death care industry. And when she’s not pumping arteries full of formaldehyde? You can find her searching cemeteries for graves with unusual histories for her popular Instagram account @DEATHstination. From celebrities to serial killers, Laura digs up the fascinating and often tragic stories of the forgotten lives interred beneath our feet. 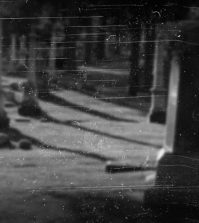 If you’ve ever walked through a cemetery and wondered who all those people were, whose entire lives are now summed up with mere names and dates etched into stone, or if you’ve ever planned a trip specifically to visit a particular grave site, DEATHstination will be your new favorite addiction. On a recent podcast, Laura recounted an incident in which she stopped for an impromptu photo shoot with a frog. A dead one. While on a date. The moment I heard that I knew I needed to feature her on Cult of Weird. CULT OF WEIRD: How did your fascination with death begin? LAURA HARDIN: That is a difficult question to answer. I cannot exactly pinpoint the moment my fascination with death began. Maybe I was just born with the fascination…? I remember being a child and conducting front yard funerals for insects. My father and I would watch Hitchcock movies together when I was young. As a teenager, I enjoyed staying home and watching Dateline murder investigations. Death, disease, serial killers, what goes into catching murders, cemeteries, etc. always peaked my interest for as long as I can remember. 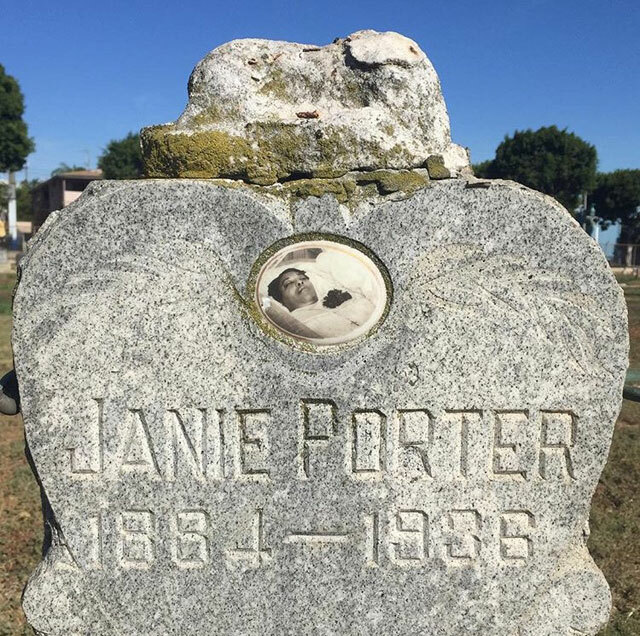 DEATHstination: The gravestone of Janie Porter with a postmortem photo of the deceased. More on this right here. Why did you decide to work in the death care industry? LAURA: When I first entered college I had hopes of becoming a great sculptor. Eventually, reality set in and I realized I needed to focus on a career that would allow me to provide for myself, so I began studying Biology. Internally, I struggled to find a balance; how could I continue with my art but also pursue Biology? As fate would have it, I wound up at Cypress College, one of only two colleges in California that offers a degree in Mortuary Science. I never realized that embalming is as much of an art as it is a science. After taking a department workshop, I knew I had to complete a degree in Mortuary Science. Have you learned anything shocking or unexpected since you became involved in the industry? LAURA: While completing my course work in Mortuary Science, one of my instructors would constantly remind us students how conservative and, at times, sexist the death care industry can be. I took what my instructor said with a grain of salt until I entered the workforce. My first year as a licensed Funeral Director, I was told by a Southern California mortuary owner that the worst thing he had ever done was hire a woman. Another mortuary owner, after meeting with a family, told me that since the next of kin had tattoos, their loved one must have died from a drug overdose because all tattooed individuals do drugs. The Funeral Director in question was unaware that I have a good portion of my body tattooed as I always cover my art in a professional setting. Rarely am I offended but, in that moment, I wanted to throw off my suit jacket and ask him if he wanted to drug test me. Needless to say, I left his firm after only one week because of continued offhanded remarks such as, “I hope a plane crashes into that new mosque they are building”. Fortunately, more and more individuals, such as myself, are entering the death care industry. Change is definitely coming, however, it is slow to manifest. DEATHStination: The grave of stuntman Alfred “Dusty” Rhodes in Colma, CA. Rhodes died in 1948 when a stunt, a leap from the Golden Gate Bridge, went wrong. Read the story right here. You collect funeral antiques. How did you get started and what are your favorite pieces in your collection? LAURA: Learning about Victorian mourning practices threw open another death door for me and I started seeking out mourning jewellery. My collection is rather underwhelming, to be honest. My favorite piece, however, is a personal one. My great grandmother on my father’s side was a migrant farmer. Great Grandma Pearl died of pulmonary tuberculosis in Arizona when my grandmother was around 7 years old. Her death left my grandmother and her 4 siblings orphans. When my grandmother became too sick to live on her own, my family and I went through her belongings to determine what to keep and what to donate. My father informed me that my grandfather’s military headstone was hidden somewhere in the house. As I searched for the headstone, I came across a small seafoam green box. The box contained a ceramic cat, a silk coin purse, and a tin plaque that read, “At Rest”. I had no clue what the plaque was but I knew I wanted it. When I tried to only take the plaque my father stopped me and told me I had to take the entire box. When I asked why, he explained that the box contained the only possessions my grandmother ever had of her mother. I later came to find out that the plaque was my great grandmother Pearl’s coffin plate. How does your work and morbid interests affect your daily life? LAURA: They do not affect my life; they are my life. My every waking moment is dedicated to death in some form or another. Some people do not understand my need to consume as much death information as I humanly can and, needless to say, I do not associate with those people. Just know, if you are ever to become my close friend, I will drag you around a cemetery. 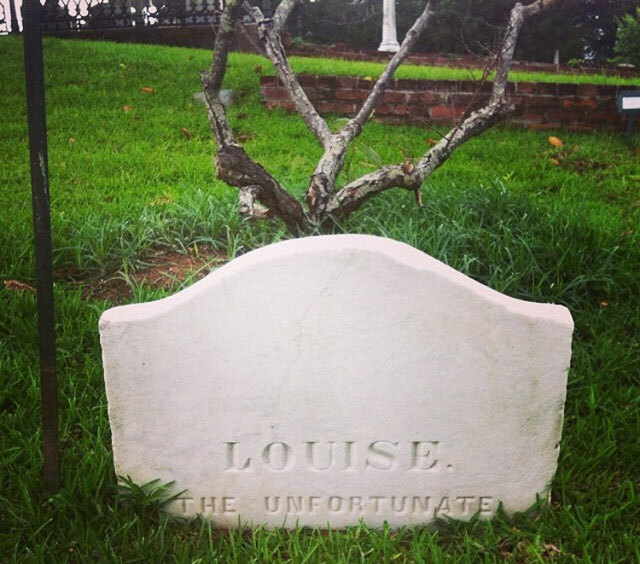 DEATHstination: Louise the Unfortunate in Natchez, Mississippi. Get the story behind this unusual gravestone right here. How did DEATHstination come about? LAURA: I always admired cemeteries. As a teenager, my mother would often take me to my grandfather’s grave. Beautiful, serene places, full of statuary, I sought the peace of cemeteries to get away from the noise of Los Angeles. On Halloween 2012, I had the idea to go decorate graves with jack o’ lanterns. My friend, Tyler, obliged my unusual request and we headed to Bela Lugosi’s grave in Culver City. After featuring some of the grave photos on Instagram, I began to discover communities of people completely dedicated to cemetery photography. As beautiful as the photos were, no one was bothering to give the history of those buried below. Eventually I discovered Pioneer Park in San Diego; a cemetery turned park. Blown away by what I learned, I traveled to San Diego with my friend, Diana, to visit the park. Sharing the history with my limited Instagram followers, I generated a good response. After that I decided I was going to start visiting as many graves as I could to create a personal scrapbook but instead ended up creating DEATHstination. What is the most unusual story you’ve uncovered when researching graves? LAURA: Driving home from the Antelope Valley recently, I spotted some graves hidden amongst weeds. I stopped to look around the property which was vacant and unmarked. Returning home, I set out to figure who was buried there. Originally, I thought they might be native graves or graves of old gold prospectors. Looking through news articles, I found a NBC 4 report regarding a fake cemetery. Come to find out, no one is actually buried on that plot of land. A resident of the area, after finding out that the California high-speed railway may be built through his property, purchased the headstones from the Whittier Museum and created that “cemetery” in the hopes it would deter construction plans. I filmed a two part video about the whole ordeal for my YouTube because it was so completely ridiculous. What are some of your favorite cemeteries and graves to visit? LAURA: Ghost town graves! Goldfield, Nevada’s cemetery in particular. Being a prospector was a tough lifestyle. 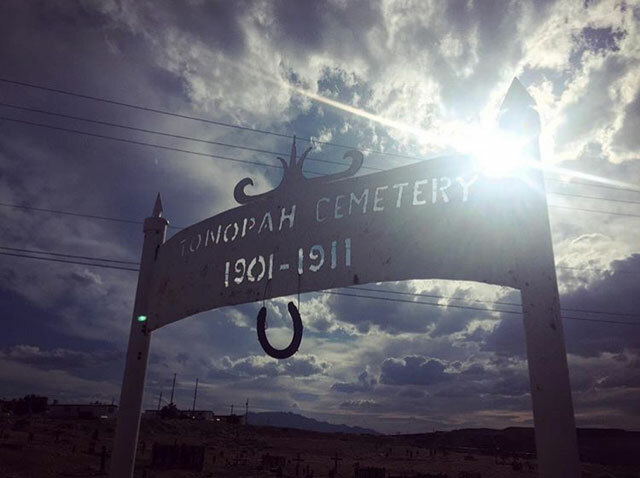 Practically everyone buried in western ghost town graves died in a tragic or unusual way. 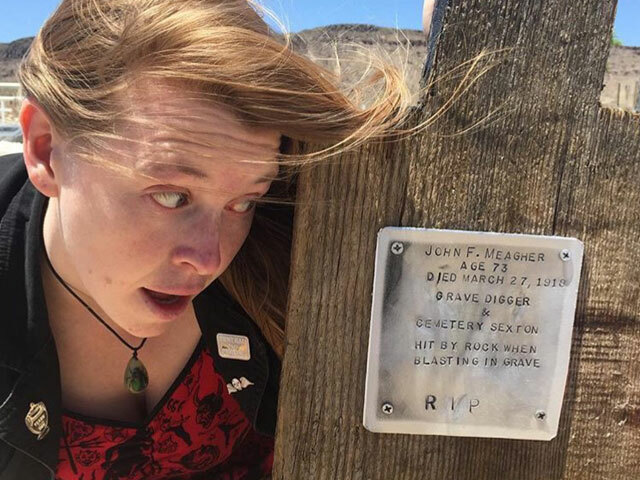 Getting crushed by rocks, runaway ore cars, mine fires, cyanide induced suicide, saloon gunfights, the graveyards are full of stories that you just do not find in modern day memorial parks. What does the future hold for DEATHstination? LAURA: I would love to generate more funding for DEATHstination and recently I created a Patreon crowdfunding campaign for my endeavour. Ultimately, I want to travel more frequently and further. I want to feature gravesites and funeral customs from all over the world. Best case scenario, I would receive a deal to conduct a television series where I can devote 100% of my time to DEATHstination and even begin publishing a series of travel books. While I enjoy working as a mortician, DEATHstination is where my heart lies. I love educating the masses and inspiring folks to visit their local cemeteries. 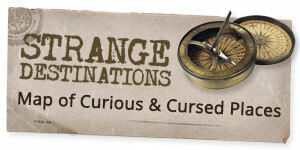 Where can Cult Of Weird readers find you? LAURA: My main source for DEATHstination is via Instagram, @DEATHstination. Occasionally I create videos for YouTube when time and electronic storage space permits. Also, as mentioned above, I do have a Patreon crowdfunding account for DEATHstination. By making a monthly pledge to DEATHstination, my patrons receive exclusive access to content that I do not feature on Instagram or YouTube. 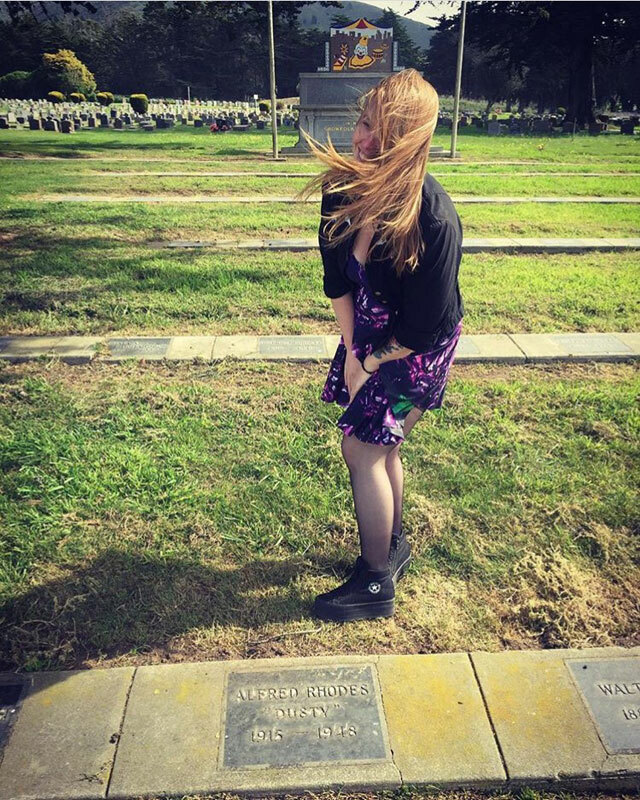 Be sure to follow Laura’s cemetery expeditions, and if you like what she does, consider helping make future DEATHstinations possible by contributing to her Patreon.